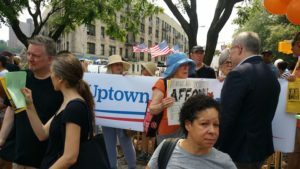 Uptown Progressive Action worked with many other uptown groups – in particular Northern Manhattan is Not for Sale – to prevent the upzoning of the Sherman Plaza property. This was a major success, dampening the attempted uses of spot rezoning all over town. We are currently working to prevent similar upzoning of the area east of 10th Avenue, which includes not only many small businesses but also a Lenapi burial ground. If you’e interested in helping, please email us!